I have found the dressing of all dressings!!! The first one (bottom right) I got from Love and Lemons, which is a Roasted Broccoli, Goat Cheese and Cranberry Salad. Salad numero dos (the bottom left) is a salad I threw together inspired by a salad I had at the Silly Goose last weekend – it’s a Caramelized Butternut Squash, Apple and Quinoa Salad, and salad number 3 – on the top is a Grilled Peach and Goat Cheese Salad (inspired by the Love and Lemons blog as well). All of these are SO good, so fresh, and the dressing is super simple and super yummy. 1. Preheat oven to 450. Place broccoli flourettes on a baking sheet and drizzle with olive oil and a few pinches of salt and pepper. Roast in the oven until dark brown. (20 minutes or so). 2. Make the dressing while you wait. In a small saucepan over low heat, heat honey and vinegar until warm. Turn off heat and whisk in olive oil. Season with salt and pepper. Set aside. 4. Assemble salad components. Toss salad with as much or little dressing as you like. 1. Caramelize the butternut squash. I did this by laying out the squash on a baking pan with a bit of I Can’t Believe it’s Not Butter, 1/4 cup of brown sugar and a dash of salt and pepper. Make sure the squash is covered. Roast at 400 degrees for 40 minutes or until the squash is soft and caramelized. 2. While the squash is caramelizing, cut the apple, toast the pine nuts, and prepare the quinoa. Place the lettuce in a bowl and prepare your dressing. 3. Once the squash is done, let everything cool a bit – pine nuts, squash and quinoa. Place the quinoa on top of the lettuce followed by the squash, chicken, apple, cheese and nuts. 4. Cover with dressing and toss well. 4 peaches cut in fourths – make sure they are ripe! 2. Toast your pine nuts and prepare the greens in a bowl. 3. Once the grill is ready – sear the peaches just until they get a nice sear to them. 4. Place the grilled peaches on top of the greens. 5. 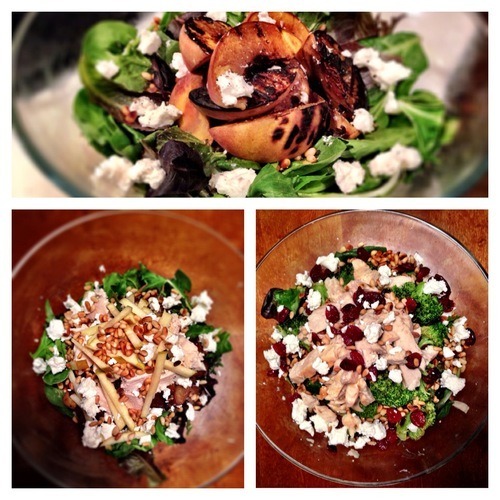 Top with the toasted pine nuts and goat cheese. 5. Cover in dressing and mix!